As genuine understanding of this emerging technology grows, now is the time to ask how it could transform your business. In less than a decade, distributed ledger technology (DLT), most notably blockchain, has transformed the way the financial services (FS) sector thinks about payments transactions, and the resulting knowledge is being applied to many other proof-of-concept projects. There is great potential for other fields to build on initial FS experience and apply DLT to a whole range of business processes and transactions. For some businesses that may be to maximize process efficiencies. For others it could mean a complete re-imagining of traditional operating models. The levels of interest, activity and investment now being seen across FS and other industries is a clear indicator of belief in the technology’s potential. However, the question remains as to where and when truly transformative impacts will be seen. So what is DLT, exactly? In simple terms, DLT is a distributed database that allows multiple parties to track transactions transparently and record entries on a shared ledger that is trusted by all parties. A “transaction” in this scenario could relate to financial instruments such as money or stocks and shares, or other assets such as diamonds, houses or land, and could even relate to intellectual property, copyrights or patents. This adaptability is a key reason why, although originating in the field of payments and value exchange, DLT holds such potential for different and diverse sectors. One of the most important features of DLT is the use of cryptographic technology to prevent tampering, giving confidence to users that the contents of the shared ledger can be trusted by providing a permanent and transparent history of the transactions. As an example, a useful video demonstration of how DLT works in the context of financial reporting can be found here. Blockchain may be both the most-hyped and yet least understood of all the technologies disrupting our modern world. In one recent global survey, 80% of those who had heard of blockchain admitted that they didn’t know what it really does. Many of those who think they do grasp blockchain probably equate it principally with bitcoin, the most prominent of many emerging cryptocurrencies that are shaking up the financial world. Blockchain is the technology that provides the transaction platform to securely record transfers of bitcoins from one party to another, thus the two are often conflated. It’s not surprising that DLT has come to be seen as a banking-specific technology. But DLT could have profound implications far beyond the world of finance. For example, multinational manufacturers are considering applying DLT to create more efficient, transparent and sustainable global supply chains, and in the pharmaceutical sector, DLT is being investigated as a way to guarantee fully transparent clinical trials of new drugs, and the accounting industry could benefit from a DLT approach to auditing and corporate reporting. In short, any sector dependent on building trust within the business, and with partners and suppliers, has the potential to improve its operations through DLT. Who is already using DLT? To help gauge the growing importance of blockchain (and DLT in general) within business, Cambridge University’s Centre for Alternative Finance, with support from EY and Visa, recently published the Global Blockchain Benchmarking Study. It surveyed more than 200 DLT infrastructure providers, application developers, service providers and operators across a range of industry sectors. Its findings show that, while the financial sector continues to lead the way in DLT innovation, other sectors are starting to catch up. When DLT service providers were asked what type of businesses are using their technologies, they confirmed that many sectors and subsectors are already active users. More than a third said they had customers that were regulators or government agencies – indicating the relevance of DLT to the public sector. One quarter cited private individuals, while almost a fifth said that creative artists were customers. Clients as diverse as energy companies, title and real estate companies, airlines, retailers, hospitals and health care organizations are all testing or using DLT applications. Given the range of potential applications for DLT, it’s not surprising that the technology industry has invested considerably in creating generic platforms and frameworks that can be adapted to any number of projects across a variety of industries. Some enterprise DLT frameworks have been downloaded more than 20,000 times. However, two-thirds of the study participants said they were focused on developing sector-specific solutions that are purposefully designed to serve a particular set of use cases. Although providers of technology solutions are not yet the largest customer segment for DLT, many are considering DLT to improve and complement their own product offerings. System integrators and Internet of Things (IoT) companies, along with know your customer (KYC) regulatory specialists, all are experimenting with DLT platforms. 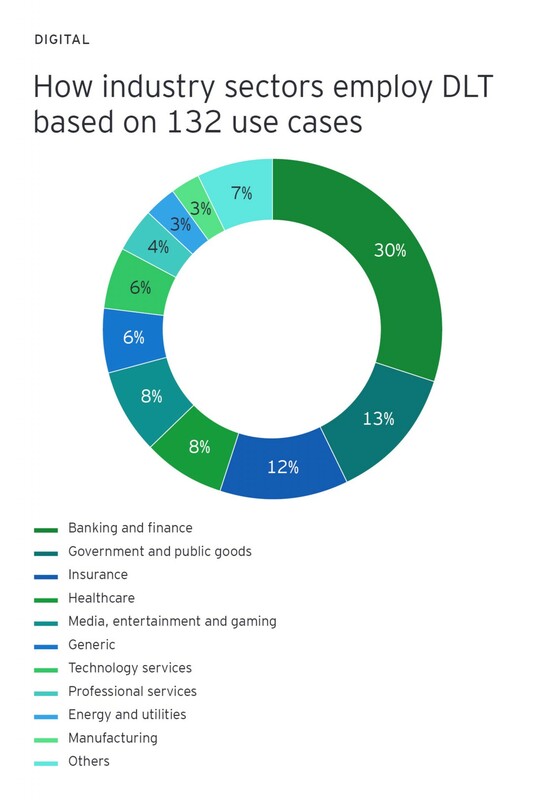 From a corporate user point of view, the study looked at 132 different DLT enterprise case studies across all sectors. While it wasn’t surprising to see that 30% are related to banking and financial services, it is notable that the government sector has been more proactive in proof of concept programs than many private industry sectors including insurance, health care and media, entertainment and gaming. How is DLT being used? As noted above, and unsurprisingly given DLT’s association with cryptocurrencies, financial services, payments and banking services are the sectors where most DLT activity currently is taking place. Capital markets clearly dominate in terms of the number of existing DLT projects, but insurance and trade finance also are seen as ripe for disruption. 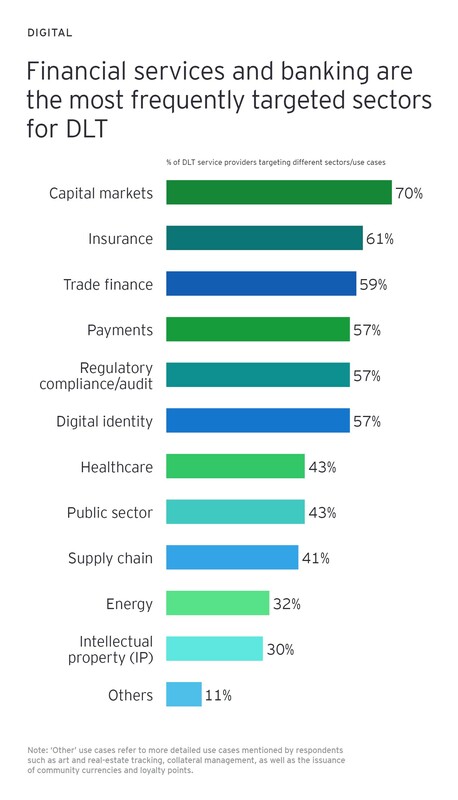 More than half of the DLT service providers surveyed said they were targeting regulatory compliance and audit use cases; the same percentage are focusing on digital identity while just under half are looking at the health care and public sectors. Just over 40% say they are looking at DLT to improve supply chain at the moment – a figure that will surely grow once the technology becomes embedded in mainstream business. But DLT isn’t just about optimizing existing processes or transactions. Applied effectively, it can bring about new transactions and facilitate new operational models. Partnering with blockchain leader Guardtime, and multiple industry participants, EY created a blockchain program that connects clients, brokers, insurers and third parties to distributed common ledgers. These capture data about identities, risk and exposures, and integrate this information with insurance contracts. This program is the first to apply blockchain’s transparency, security and standardization to marine insurance. In doing so, the program brings industry-wide transparency to a traditionally convoluted insurance process through real-time visibility into the location, condition and safety of high-value assets moving around the world. This helps clients to ensure accurate and fair underwriting and pricing as well as more streamlined regulatory reporting and compliance. Following the proof-of-concept stage the program is now set for commercial use. 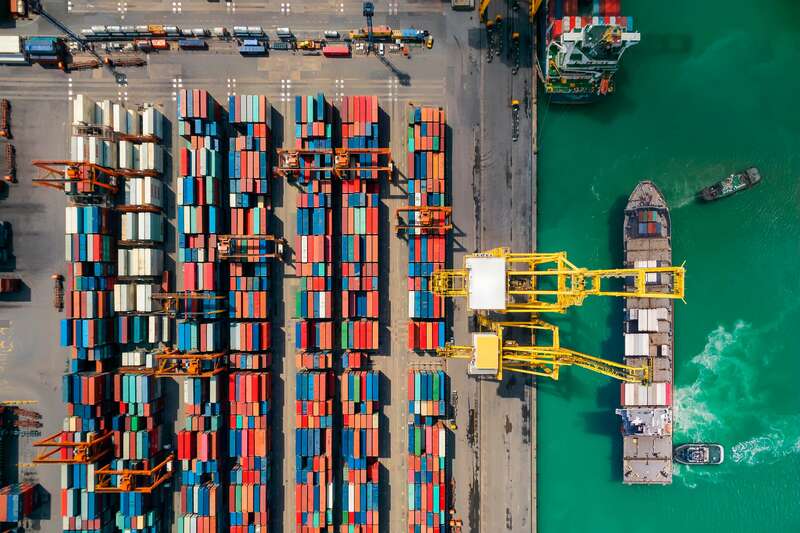 As more marine companies and insurers adopt blockchain, the ripple effect of efficiencies caused by new technology and processes could transform one of the oldest established area of insurance – one which has grown to become a US$30b global ecosystem. To help the automotive and transportation industry as it becomes increasingly integrated, on-demand, personalized and autonomous, EY created Tesseract, an integrated mobility platform underpinned by blockchain technology. The platform facilitates fractional vehicle ownership, shared use and seamless multimodal transport, helping to lay the groundwork for how autonomous vehicle fleets can be owned in the future and providing access to a variety of on-demand mobility options. Tesseract brings together multiple stakeholders including original equipment manufacturers, mobility and transport companies, cities and infrastructure providers on a single platform to facilitate new value and revenue streams. It can also help consumers gain access to the right type of vehicle for their ideal journey, on demand. With Tesseract, single vehicles, fleets and other transport services are available on the platform. Vehicles and trips are digitally logged on the blockchain, and transactions are automatically settled between owners, operators and third-party service providers through a single-source, usage-based payment system. Ownership of the assets is flexible and can be on a full or fractional share basis. As new business models and income streams are created, funding of expensive assets such as batteries and charging infrastructure will become much easier. Sustainable energy and mobility have developed rapidly in the past five years. Tesseract aims to better connect these complementary parts of the intermodal transport ecosystem, to deliver faster and more profound change and build a better world. Ready to get started with DLT? Blockchain’s rise began as the platform for a monetary payment solution but was soon embraced by many other parts of the FS sector. That evolution, both in terms of technology and culture, has made FS a leader in DLT experimentation. So what does a business need to consider in order to get the most out of DLT? Success doesn’t happen overnight. FS has learned through proof of concept projects how DLT can improve existing transactional functions. However, large scale use in production remains limited. Confidence comes from experimentation. The shared experience of trialing proof of concept programs allowed infrastructure providers, application developers and operators to develop DLT to begin to address a number of industry needs. Keep an open mind to DLT’s possibilities. It would have been easy to look at blockchain purely in terms of monetary transactions but, instead, FS has applied DLT thinking across a range of functions – so increasing its usefulness for the sector as a whole. Nearly a decade on from blockchain’s introduction to the business world, the depth and breadth of DLT experimentation currently in motion demonstrates just how influential this new way of ensuring transactional trust, credibility and accountability could be across all industries. The FS sector is leading the way. However, despite its potential, the technology still has a long way to travel to full maturity and large scale adoption. 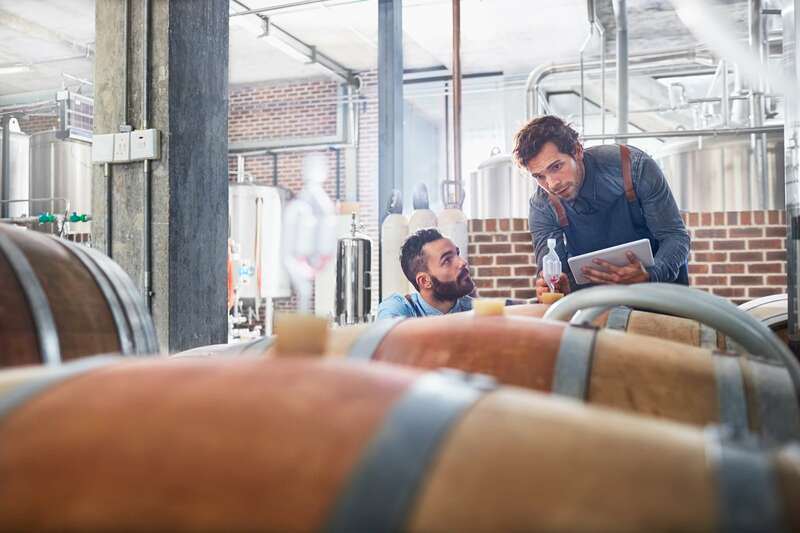 As genuine understanding of this emerging technology grows, now is the time to start asking how it could be most beneficial in the transformation of your own business. Discover the full Global Blockchain Benchmarking Study here. To benefit from DLT, leaders should consider the potential impact on their organizations and test and learn.